Vindication. 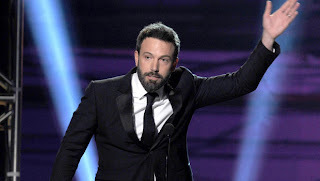 Hours after one of the most egregious snubs in the history of the Academy Awards, Ben Affleck was walking off a stage in Santa Monica, California with the two biggest trophies doled out by the Broadcast Film Critics Association (BFCA), a group I proudly claim membership in. Having cast my vote for Affleck as Best Director, playing at least some role in some measure of redemption feels rather satisfying. Though I'd prefer to have the members of the Academy who voted for David O. Russell and Benh Zeitlin over Affleck and Kathryn Bigelow exiled.